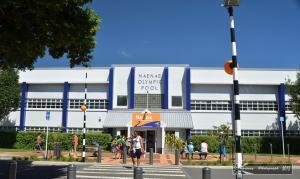 The Naenae Pool is a public 50 metre indoor pool complex with a moveable bulkhead. The pool has a 100 metre enclosed waterslide called the "Zoom Tube" as well as the Zipline, diving boards, sauna and sunbed. The Zipline is an exciting flying fox ride which takes you the length of the Pool with a 5 metre drop. The Pool now also offers the newest learners and toddlers pool in the City, with fun water features and exciting Pirateship. This page is current to 21 Apr 2019, 02:59:32 PM and took 0.329 secs to generate.